Hawk Mk IV - end of prod. Super Snipe Mk III - end of prod. 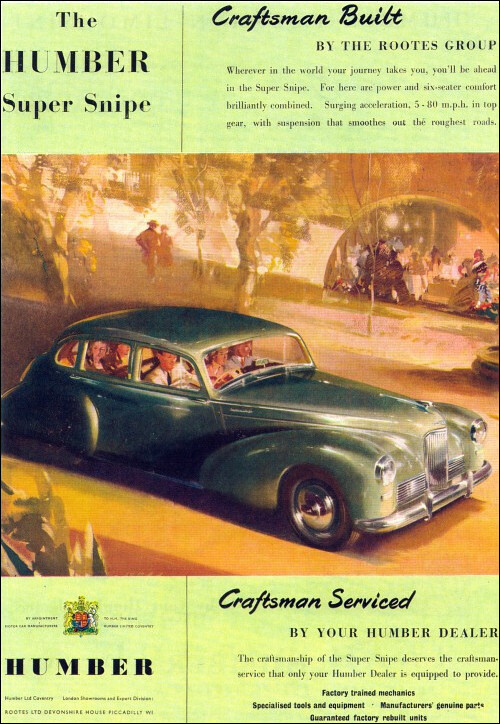 Humber Pullman Mark III and Imperial Mark III are similar in most respects. Wheelbase is 10 ft 11 in, engine a 100-bhp 4-litre OHV Six. Both are eight-seaters, bodied by Thrupp & Maberly. Other contemporary Humbers are the Hawk Mark IV and Super Snipe Mark III. 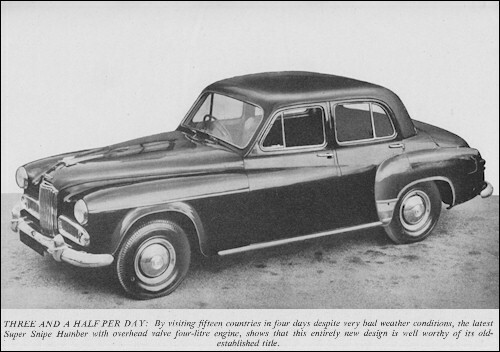 Hawk MkV model 1953 gets lower bonnet line different grille and extra chrome, and touring limousine option. 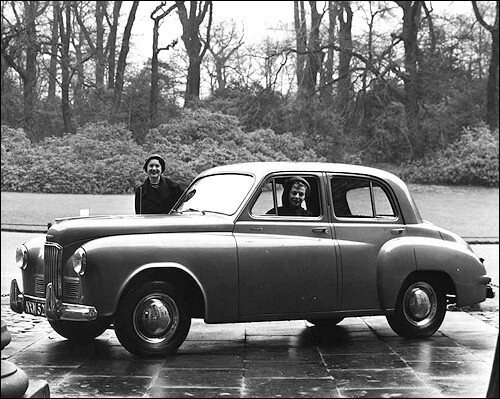 Super Snipe Series IV introduced in October 1952 has Minx / Hawk derived body with extended boot and bonnet and 113 bhp 4138 cc six cylinder ohv engine. 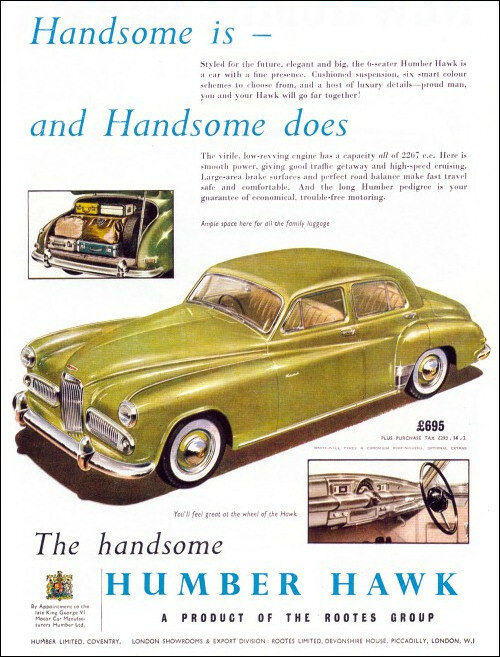 Although no fundamental changes have been made in the design of the popular Humber Hawk for the coming season, the 1953 models incorporate a large number of detail refinements in both chassis and body. Amongst them are several prominent external changes which combine to make the latest cars quite distinctive. Most notable are a lowering of the bonnet line and an alteration in the shape of the two horizontal grilles which flank the main radiator grille; these are now provided with plated surrounds extended laterally to include the side lamps. These alterations are set off by a full-length chromium-plated bumper of different section, which is arranged to provide a good wrap-around to protect the wings and also has over-riders as standard. Similar bumpers are used at the rear. The base of the body is now finished off with a chromium-plated sill moulding which protects an otherwise vulnerable area of paintwork from accidental kicks, as well as having a decorative purpose. Corresponding dual advantages apply to the chromium-plated wing protectors now fitted to the base of each rear wing. From the rear, the latest model is easily distinguishable by its much larger rear window; this now extends almost to the full width of the car, measuring 45½ in. by 13¾ in., compared with the previous dimensions of 40¼ in. by 12¼ in. To increase leg room, the rear seat pan has been moved back slightly in relation to the body shell, the change amounting to 1 in. at the top and ¾ in. at the base. The door fittings have also been revised and press-button handles adopted, whilst special care has been taken to avoid any possibilities of rattle by the use of a spring-loaded wedge fitting so arranged that, if relative movement does, in fact, take place between the door and body pillars, the effect is merely to allow the wedge to move farther into its housing under the influence of the spring, thus providing an absolutely firm location. Interior trim has been modified to give a more pleasant appearance and the armrests on the front doors (which also serve as door pulls) have been made softer in the interest of comfort. Whilst the basic layout of the facia board remains much as before, a large number of new features has been incorporated. Edge lighting has been adopted for the dials and the instruments are now recessed in the central panel to cut out any possibility of reflections of the lighting in the curved screen at night, the semi-circular speedometer being further shielded by an extension of the central pressing in the form of a cowl. In addition to former details, a headlamp beam indicator light has been added in conformity with the requirements of some American states. Re-designed control knobs, lettered to indicate their purpose, are another innovation. A changeover has been made from a hand to a foot-operated dipper switch, the latter taking the form of a pedal which, in fact, matches the organ-type accelerator and is deliberately intended to act as a rest for the driver's left foot-a plan which might well be widely adopted. A further electrical change lies in the use of a more powerful screen-wiper motor, whilst a small item, which will be appreciated by those who have occasion to leave their cars in public garages, is that the glove box is now provided with a lock, the key of which is the same as that of the rear locker and different from the ignition key. In other words, users can leave their cars in a driveable condition when required without loss of security in the matter of bag and baggage. On the mechanical side, special attention has been paid to improving handling qualities. To this end new shock-absorber settings have been adopted at the front, whilst the rear dampers have been increased in size (Armstrong DAS9 in place of DAS8), with the object both of giving longer life and reducing variations in damping qualities brought about by temperature changes. Both the forward portions of the channel-section side members and the engine sub-frame on recent models have been boxed to provide greater front-end stiffness, whilst the front body mountings have been moved forward approximately 9 in. ; in addition, extra mountings have been provided at the rear, the whole idea being to increase the torsional rigidity of the complete body and chassis when acting together as a unit. 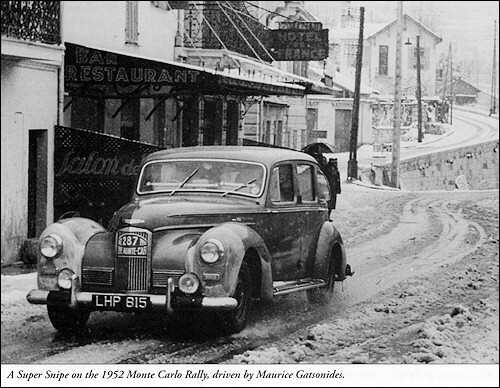 The 2.3-litre four-cylinder side-valve engine remains as before except that the automatic choke has been replaced by a hand-control, whilst the throttle linkage is now of the all-rod type, this latter change having been made both to give more positive action and to avoid any difficulties with cables freezing in cold climates. Mention of the latter brings one to another refinement that will be appreciated, namely, a remote control for the cylinderblock drain tap, which was formerly rather difficult to reach. In addition, the bonnet is now counter-balanced by spring-loaded hinges. A larger single-dry-plate clutch (of the 9-in. type in place of the former 8-in. size) is fitted and an improved material is used for the withdrawal bearing which, as -before, is of the type requiring no lubrication. 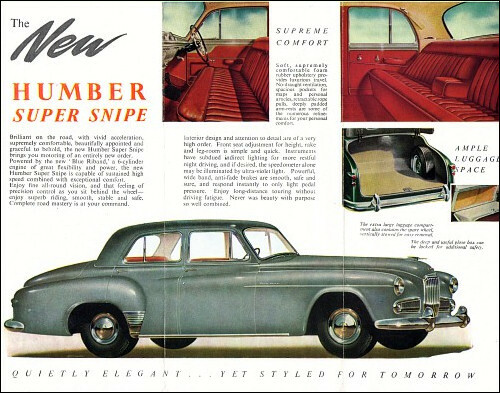 The largest car in the Rootes range, the Humber Super Snipe continues a long-established name with an entirely new car. The purpose of the vehicle remains, however, to give better than normal average speed with outstanding hill climbing and top gear acceleration, these qualities being achieved by fitting a large capacity engine in a car of moderate size and weight. The new engine, like the former side-valve unit, is of the six-cylinder type, but develops 113 b.h.p., which represents an increase of 13 per cent. Although of much the same size (4,138 c.c. compared with 4,086 c.c. ), it has a closer bore/stroke ratio (1 : 1.25 compared with 1: 1.41) and is notable for the low speed at which its maximum power is developed-actually 3,400 r.p.m. This fact, coupled with the shorter stroke, the seven-bearing crankshaft and the moderate output of 27.6 b.h.p. per litre, should make for exceptionally long life, particularly in view of the higher gear ratios now used. In terms of ultimate performance, the makers give the maximum speeds as 90 m.p.h. and 94 m.p.h. according to the axle ratio chosen (the previous side-valve model, when tested by "The Motor", recorded a mean speed of 81.6 m.p.h.) and, even for those who are not directly concerned with absolute maxima, these figures are interesting as an indication of the even-more-effortless cruising speeds to be expected from the new model. Push-rod operation is used for the overhead valves, which are arranged vertically and in line, the rocker shaft being divided into two sections (each carried on three standards) to facilitate machining. In accordance with modern practice, the inlet valves are larger than the exhausts, having respective diameters of 1.74 in. and 1.51 in., and double springs are used. The valves are retained by split cotters and special precautions against excessive quantities of oil reaching the stems are taken in the case of the inlets; to this end, the collar is sealed at its base by a Neoprene ring seated in a groove in the stem and, in addition, a pressed-steel shroud is arranged to surround the exposed portion of the stem. All the valves have separate ports and an interesting detail is the use of spigoted sleeves in the inlet ports of numbers three and four cylinders to ensure correct alignment of the manifold. The latter is of cast aluminium and is mated to the cast-iron exhaust manifold at the centre to provide a localized hot spot immediately beneath the down-draught Stromberg carburettor; both the manifolds are open-ended at this point and are sealed by a stainless-steel plate which has a tongue projecting into the exhaust manifold to ensure good heat transference. The exhaust gases are led away to the extreme rear of the chassis where a single silencer is arranged across the frame in a position where both noise and heat are at maximum distance from the passengers. Valve adjustment is of the usual cup-and-ball type at the rocker ends, and the lower ends of the tubular push rods are carried in spherical seatings in chill-cast cylindrical tappets. The cams have quietening ramps and the camshaft is carried in four steelshell white metal bearings and driven by a duplex roller chain at the front end. Chain tension is maintained by a slipper plate and a spring-loaded blade assembly bolted to the front wall of the crankcase; the fixed slipper plate is arranged to be just clear of the taut run of the chain when the latter is under load and the nitrided blade is maintained in contact with the free run by a hollow spring-loaded plunger. The forged-steel crankshaft has seven bearings, each 2¾ in. in diameter and of the steel-backed, white-metal type, the same kind of bearing being used for the 2¾-in. diameter crankpins. The shaft is statically and dynamically balanced, is provided with a Metalastik bonded-rubber vibration damper on the nose and is drilled in the usual manner for lubrication. Drillings are also provided in the forged-steel con.-rods to provide force-feed lubrication to the little ends also. The big ends are split diagonally at 45 deg. and dowelled to the rods, attachment being by means of set bolts. An oil-bleed hole is provided for cylinder-wall lubrication. Lo-Ex alloy pistons, taper and oval ground, are used and are of the split-skirt variety with two compression rings and one scraper, the top ring being chromium-plated to resist corrosion. In addition, a ring groove is provided in the skirt to accommodate a fourth ring when further oil control becomes necessary and thus prolong the time before a rebore eventually becomes necessary. The piston crowns are raised in the shape of a truncated cone and fully-floating gudgeon pins, running in lead-bronze bushes and located axially by circlips, are used. Special attention has been paid to providing generous water passages and a distribution pipe inserted in the head ensures a supply of cool water to the area of the exhaust valve seats and plugs. Oil filtration is effected by the combination of a floating intake on the gear-type pump and an A.C. full-flow filter; fuel cleanliness is ensured by the usual bowl-type filter built into the inlet side of the mechanical pump, plus a further bowl-type filter between the pump and the carburettor; and the air filter is of the oil-bath type irrespective of whether the car concerned is intended as a home or export model. Apart from the closer ratios in the gearbox and the choice of either a 3.7 : 1 or 3.9 : 1 rear axle (both higher than the former 4.09 : 1 ratio), the only notable transmission features are the use of internal splines in the gearbox for the sliding joint and the adoption of a hypoid final drive. As before, the gearbox follows the well-known Rootes Synchromatic design with a control-ring type of synchromesh on all four gears and a steering-column control. The re-designed chassis frame is of boxed channel-section for most of its length and the cruciform member is now of "I" section and extended further forward than before, with additional bracing at the point where the side members now sweep inwards to mate with the pressed-steel structure which is welded to the main frame and carries the new front suspension. At the rear, the frame is braced by two channel-section members, which also serve as upper abutments for the 1½-in. Woodhead Monroe direct-acting dampers and to carry the 15-gal. fuel tank which is constructed from corrosion-resisting tin-terne coated steel sheet. Semi-elliptic leaf springs are retained at the rear, where each spring is 52 in. in length and has six blades, plus one auxiliary, each 3 in. in width. To overcome squeak, rubber buttons are inserted between the ends of the leaves. As already indicated, the front suspension is entirely new to this model. Wishbones of unequal length are employed and inclined rearwards to give a considerable trailing effect, whilst threaded steel bushes are employed throughout to provide increased bearing areas and better retention of lubricant. An interesting point is the use of an eccentric upper pivot pin to provide a ready adjustment for camber. The coils have a static laden length of 10.7 in. and the system provides for a total wheel movement (full bump to full rebound) of 6.9 in. Control, as at the rear, is by means of Woodhead Monroe telescopic dampers housed, in this case, within the spring coils. As before, Lockheed hydraulic brakes (with two leading shoes at the front) are employed, but the use of smaller wheels with larger-section tyres has called for a revision of drum sizes. The latter are now smaller in diameter but wider, the net result being an important increase in total lining area from 162 sq. in. to 191 sq. in. In the design of the body, the passenger accommodation has been revised to give a slightly-more-compact arrangement, with a considerable increase in luggage space. Total passenger compartment length is now 7 ft. 11 in. (formerly 8 ft. I in. ), and the elbow room across the front seats is 55¼ in. (56½- in. ), the corresponding rear measurements being 57 in. (60 in.). Headroom, on the other hand, has been increased by 4 in. at the front and 1 in. at the rear. Both seats are of the bench type, with folding central arm-rests, and Dunlopillo foundations, shaped to give correct support as well as softness, are used for both seats and squab. The central arm rests are also of Dunlopillo, whilst additional arm rests (which also serve as door-pulls) are provided on all doors. The front seat is adjustable for height (this also affecting rake) as well as for reach. Provision is made for radio and the space for the control panel is designed so that it can be used as a handy receptacle for odds and ends when radio is not fitted. In addition, there is a lockable cubby-box, the key of which also fits the luggage boot and is different from the ignition key. Deep pockets are provided in the front doors. 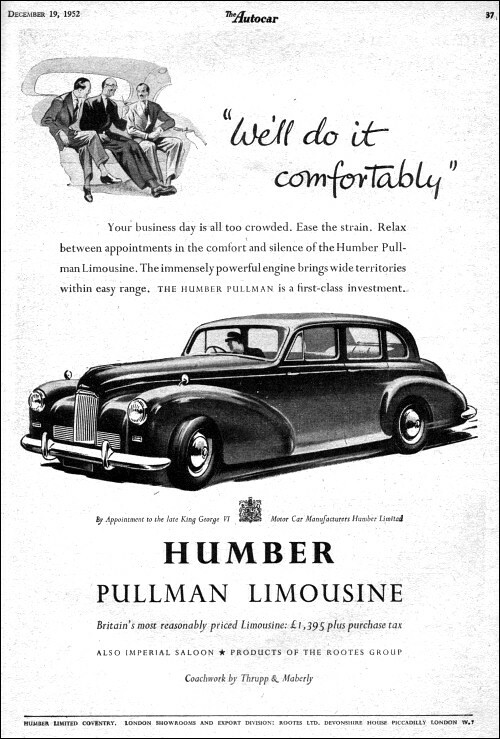 So far as main luggage is concerned, the new boot is larger than anything provided on any previous Humber Snipe, the maximum length from front to rear being 43½ in., and the maximum width no less than 61 in., giving a total capacity of 19½ cu. ft. The spare wheel, which is carried vertically in a longitudinal plane, is recessed into a well on the off-side, whence it can be withdrawn without disturbing the luggage. As in the case of the bonnet, counter-balanced hinges are used for the boot lid.